A laminectomy procedure on the lower back is one of the most common procedures to treat spinal stenosis, a narrowing of space around the spinal cord. 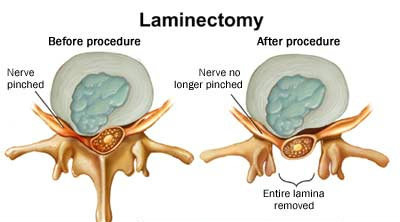 In a laminectomy, surgeons remove the lamina, a bony structure that protects the spinal cord, to relieve pressure causing neural issues and pain. Following a laminectomy surgery, orthopaedic care can aid in the recovery process and help you get back to feeling your best. Essentially, a laminectomy is performed when other options to alleviate the problem fail to work – it is often a last resort. The spine is a complex structure. It is made up of 33 vertebrae or bones. These bones of the spine protect the spinal cord. The spinal cord is home to an intricate network of neural bundles stemming from the brain. The brain and spinal cord are the structures that comprise the central nervous system. The central nervous system drives every movement, breath, and thought we make. It is the center of our being. Damage to the spinal cord can cause varying degrees of problems, including paralysis and regulatory functioning issues. The lamina is the back arch of the vertebrae bone. It protects the spinal cord from outside impact or harm. When abnormalities or bony overgrowths develop on the spine, neural functioning may become significantly impaired and pain may occur. Spinal stenosis, a narrowing of the spinal canal, may create pressure on the nerves that run through the spine. Bony overgrowths due to age or arthritis may also compress these fragile neural networks. Consequently, pain, numbness, and weakness may occur. In severe cases, the individual may struggle to walk and may lose control of their bladder and bowel movements. When the symptoms become severe enough that they impact day-to-day function and when other treatment options fail to work, a laminectomy is performed. In other words, the lamina portion of the vertebrae is removed. What Does a Laminectomy Involve? A laminectomy surgery in Singapore involves the use of general anesthesia. However, before surgery the appropriate tests and examinations are performed to ensure as little risk as possible. Your doctor will also ask you to avoid food and drinks for a set time before surgery. Your doctor will also ask that you avoid NSAID, nonsteroidal anti-inflammatory drugs, the week before your surgery. Depending on the part of the spine that the laminectomy is performed on, it often lasts 1-2 hours. The medical team measures your heart rate, blood pressure, and oxygen levels throughout the procedure. An incision is made at the affected vertebrae. The aggravating part of the lamina is removed, relieving pressure off of the spinal cord. Depending on the severity and type of condition you have, the surgery may also involve spinal fusion or the removal of a slipped disc. Your surgeon will discuss the plan with you beforehand. Following a laminectomy surgery, the surgery team will take you to a recovery room. Some will be required to stay in the hospital of a few days, while others may undergo a same-day discharge. It entirely depends on the severity of your situation and how invasive the surgery was. What Are the Risks of a Laminectomy Surgery in Singapore? Frequently, individuals experience relief after surgery. However, surgery may not fully eliminate the cause and it will only remove the decompression in the part of the spine operated on. For example, arthritis or spinal stenosis may still progress after surgery. The surgeon will likely require you to walk and perform movements right after the surgery. These tests will ensure no damage was done to the spinal cord. They may also prescribe pain relief medication during the initial recovery stage. Take the advice of your surgeon, and slowly and gradually increase your activity levels. Follow-up appointments will help guide you through the recovery phases. Recovery is often 2-6 weeks. Again, it may depend on your condition and the exact type of surgery performed. For example, if a bone fusion was also performed your doctor may recommend a back brace as part of the recovery process, and your recovery may be slightly longer. You will have to work to keep the incision clean and dry, particularly the first few days after surgery. If swelling or tenderness occurs at the incision site, seek out medical attention immediately. An infection could potentially develop. Your surgeon will outline how to avoid infection following the surgery. Avoid sitting for long durations. Avoid driving for 2-4 weeks right after surgery. Discuss your options and prognosis with your surgeon. Do not bend or twist the torso. This could potentially open the incision and cause other problems. Do not smoke. Smoking may interfere with your body’s ability to heal properly and quickly. Avoid travelling. Car rides or plane rides may increase your risk of developing a blood clot. Back surgery sounds scary. It is absolutely normal to experience worries or concerns regarding your surgery and recovery. Ask questions beforehand and after the procedure. Our team of surgeons and doctors would be more than happy to address any concerns you may have. At the 6 week mark, regular activities can often gradually be resumed. Neural pain may subside in about 4-6 weeks. And pain and swelling will decrease over time and eventually, with use. Following a laminectomy, chiropractic care and physiotherapy may be recommended to help guide the rehabilitation process. Chiropractic treatment can also coincide with physiotherapy treatment, and vice versa. However, initial healing must take place before you seek out chiropractic or physiotherapy care. The body is fragile after surgery and a certain amount of rest and time must take place before any spinal manipulation is performed. Often, physiotherapy and chiropractic care can begin about 2 weeks post-surgery. Research has also supported post-surgery chiropractic and physiotherapy treatment. In the case of a laminectomy, patients reported improved function, mobility, and decreased pain with treatment. No adverse or detrimental effects were reported. Most experience reduced back pain symptoms. A Laminectomy surgery improves pain in about 70% of patients. If you follow proper guidelines and instructions, your quality of life may significantly improve post-surgery. A positive attitude and proper care following your surgery can go a long way and can drastically impact your results. However, you may not notice the results straight away. It may take up to 6 weeks to notice any notable difference. Chiropractic care and physiotherapy can also help restore mobility and reduce incidences of pain during the later stages of your recovery. Your healthcare provider can recommend exercises throughout the recovery process to help you get back to your regular activities and improve your outcome. Make sure to always follow the direct advice and instructions from your doctor. For more information regarding laminectomy procedures and post-surgery care, contact us at +65 9734 3087. If you wish to have your back pain assessed, book an appointment. At the Singapore Sports and Orthopaedic Clinic, our orthopaedic specialists are ready to help you get back to the activities you know and love. Call us today. Start your journey toward a better life. Spinal stenosis is the result of the narrowing of free spaces in the spine. This will cause extra pressure to act onto the spinal cord and the nerves running through it. In majority of the cases, spinal stenosis affects the lumbar spine. This will eventually cause pain along the legs and make walking a difficult task to accomplish. As we grow older, our soft connective tissues such as the tendons and ligaments will start to harden and thicken. When this happens, spurs will start to develop and some may make their way into the spinal canal. This will result in the damaging of the vertebrae and cause the facet joints to wear and tear. Eventually, this will cause the narrowing of the lower spine. When one of the many vertebrae slips over another, this will cause congestion and narrow the spinal canal. Spinal tumour. Spinal tumours are abnormal growth of soft tissues that will cause inflammation of the spinal canal. White blood cells will rush to the site and cause an overgrowth of new tissues. This will eventually result in the narrowing of the spinal canal. Accidents especially high impact ones may shatter or dislocate the spine, causing small bones to impinge onto the canal. The pain in the legs are usually due to inefficient circulation of the blood. Leg pain will usually go away with rest but patients with spinal stenosis will get persistent leg pain despite resting. Narrowing of the spine will also cause nerve impingement, resulting in important nerves to be deprived of the abilities, leading to incontinence. Spinal stenosis have no unique signs nor symptoms and will worsen over time. Although x-ray results look promising, there is still uncertainties. The best method to manage lumbar spinal stenosis is to understand the disease better and to strengthen the back by engaging in strengthening activities daily. Stiff Neck – An Underlying Spine Disorder? Stiff neck causes pain and discomfort when attempting to move your neck. It is often due to injury to the soft tissues and ligaments at the neck region. It is usually accompanied by pain and soreness in the neck, shoulder and arm. Symptoms can last for quite a fair bit of time and it can be relieved using medication or a warm compress. For cases whereby the symptoms go away in a couple of days, there isn’t much of an underlying issue. Stiff neck can occur when you wake up after having slept in an awkward position for a long time. Sometimes, stiff neck can be an indication of an underlying spinal disorder. We must first know the basic anatomy of our neck. Our neck is divided into 2 regions namely the anterior and posterior. There is a part of our spine that moves through our neck and that is the cervical spine which is effectively made up of 7 vertebrae. Any slight problems in our spine can ultimately lead to neck pain since they are interlinked. There are 2 common spinal disorders which are Cervical Herniated Disc and Neck Arthritis. Cervical herniated disc is one of the leading causes for neck pain and indicates an injury to the cervical spine. Pain in the neck is caused by the disc pinching onto the cervical nerve, causing pain to flow down the nerve pathway down to the neck. Some patients may also experience numbness at the neck region. Another common cause is due to cervical osteoarthritis which is a degenerative joint disease or otherwise known as neck arthritis. Cervical osteoarthritis are characterised by the presence of bone spurs which may impinge onto a nerve. When impingement happens, the pain will radiate down the nerve onto the neck region, creating in neck pain similar to the cervical herniated disc. It can also be due to cervical spondylosis which is another degenerative disease that is increased by previous injuries. Cervical spondylosis can result in neck pain and stiffness and is due to the wear and tear of the cartilage and bones of the cervical vertebrae. There are many causes for stiff neck and it could indicate an underlying spinal disorder due to the mechanism for both neck arthritis and cervical herniated disc. The best way would be to seek a doctor immediately if you frequently encounter a stiff neck. Epidural Steroid Injections (ESI) is commonly administered to patients suffering from lower back or leg pain. Lower back pain is due to the inflammation of spinal nerves, causing pain and discomfort to patients as the nerve passage is narrower compared to healthy patients. Corticosteroids are extremely strong pain relief medication that is injected directly into the area of concern, providing immediate relief. However, most patients undergo the procedure with the mentality that they will be “cured” from their lower back pain. This is a misconception of it and in fact, there are many more misconceptions out there about ESI. Well, this is a misconception although it is true to a certain extent. Many people think that steroid injections are much safer than oral consumption of steroids. However, this really depends on the medication that is prescribed as the toxicity differs. While oral consumption of medication may cause irritation to the stomach and with the fact that it “travels” a longer distance down, there is a higher risk of allergy. However, ESI are injected directly into the affected area and when something bad occurs, it happens immediately without providing you much reaction time. Many doctors tell their patients that a minimum of 3 ESI is required before they are effective. However, this is the average value comprising data from hundreds of thousands of patients worldwide. In fact, the exact amount of dosage required by each patient is never the same due to the differing genetics of each of us. Some patients get immediate relief after just a single injection while some may need a lot more to see results. Most of us would have visited the hospital for one reason or another and a high percentage of us have had multiple needles injected into us. ESI are totally different from your usual invasive treatments. Only a single needle is required to be injected as ESI is done under the guidance of an X-Ray machine, providing the doctor with the exact spot to inject. While you may get immediate pain relief from the compressing of spinal nerves, you may suffer temporary pain in the form of bruises and tenderness due to the injection. Although the technique is conducted under the guide of an x-ray machine, human error is bound to happen. Bruising and swelling will go away on its own in just a couple of days. Epidural Steroid Injections have been performed for a long time and it has a track record of being rather safe and successful. Since the procedure is an outpatient one, patients do not need to spend a night in the hospital, making it much more flexible and economical for them. What is Slipped Herniated Disc? Our spine is composed entirely of bones called vertebrae and providing them with cushioning are small discs called the intervertebral discs. Over time, the intervertebral discs can lose their elasticity and will place the spine at a higher risk of injury. Pain in the spinal disc have many different terms, the common ones being “pinched nerve”, “slipped disc” and “slipped herniated disc”. The truth is, all of the terms refer to the same thing. Many patients who suffer from back pain, leg pain and the weakening of the lower core muscles are usually diagnosed as suffering from slipped herniated disc. Over time as we age, the disc will lose its water content and become less elastic. If the event that it ruptures, the spinal disc will get pushed out of its normal position and if they pinch onto the spinal nerves, it is called slipped herniated disc. Slipped disc can also occur due to other reasons beside ageing such as traumatic injuries or cyclic loading of the spinal area. When the herniated disc pinches onto the spinal nerves, it will affect the normal signalling process of the nerves and can even stop the signals from being passed. Some common symptoms of a slipped herniated disc include sharp electric shock pain, muscle weakness, loss of bladder or bowel control and numbness. If the pinching of the nerves by the herniated disc causes high pressure, it can cause weird sensation such as a sharp electric shock kind of pain and the pain can travel down from the neck area to the arms and legs. Since there is a loss of signalling functions, the instructions from the brain can be interrupted and that can cause weakening of the muscles. One common way to diagnose this is to test for reflexes. If there is a lag in reflexes, it is a sign of nerve irritation. Another symptom is the loss of bowel and/or bladder function. Since there is an issue with nerve signalling, the body is unable to properly control the bowel and bladder and can cause them to release substances without you wanting to. It can also be the other way round where you wish to urinate or defecate but you are unable to. Another common symptom is numbness of a particular area for a long time as numbness usually indicates nerve damage. The loss of body functions due to nerve damages can affect our lives greatly and we should always take all precautions to protect our spine. This can be easily done by the usage of protective equipment during high impact sports as well as lifting heavy objects using the correct method. Our musculoskeletal system consists of the bones, ligaments, tendons and many more that allows us to move around. Disorders to the musculoskeletal will affect our locomotion and will cause problems to our daily lives. Disorders are often due to cyclic stresses and strains caused by our daily activities. Some occupations have an increased risk for Musculoskeletal disorders and our shoulders, hands, neck and back are the ones that are usually affected. Carpet layers are workers who lay carpets for customers. They are required to be in a kneeling position for prolonged periods of times daily and they not only have to kneel on a hard surface, they also have to use a knee kicker to stretch the carpet to ensure proper alignment. Whenever we kneel down, our body weight is fully on our both knees and keeling for long periods of time on a hard surface will cause even more damage to the meniscus and kneecap. Over time, the meniscus will wear off and the kneecap will also get damaged. Movers are often required to carry heavy loads on their back and this will cause serious musculoskeletal problems such as chronic back pain, sprains, strains and even slipped disks. Back strains are often caused by overloading and poor lifting techniques. If it continues, the muscle can get torn and that will cause inflammation, causing pain and possibly muscle spasms. An injured back muscle will need to work even harder to protect and support the spine, leaving the spine at an additional risk to getting injured. Office workers work in probably the most relaxed and ideal conditions but they are one of the ones with the highest risk to musculoskeletal disorders. Sitting in a poor posture for a day causes more damage to the body than manual work. Poor posture such as hunching can cause lower back pain and shoulder stiffness. Prolonged sitting in a fixed position can also cause an overload in the muscle structures. Construction workers are often required to carry heavy static loads throughout the day. To distribute the weight better, they often carry the items over their head in a outstretched position. The muscles are thus unable to contract and this will injure the muscles and even hinder the proper blood circulation around the body. Prolonged period of poor blood flow can cause the arms to swell. It is easy to prevent musculoskeletal disorders by making small changes to your daily lifestyle. The working environment needs to be changed and you also need to be aware of the hazards you are faced with and overcome them. An unfortunate accident occurred one day while you were playing contact sports and that left you with a knee injury. You know that you need to consult a medical professional for this injury and you start to evaluate the options available. Should you go to an Orthopaedic doctor or should you go to a Chiropractor? Each has its own advantages. For some cases, chiropractic sports are great to treat certain injuries while some injuries fall outside the jurisdiction of chiropractic and only orthopaedic surgery can treat them. Who are Chiropractors and how do they treat an injury? First of all, Chiropractors are not medical doctors and they do not prescribe medications. Chiropractors believe in hands on and alternative treatment instead of surgery. They believe that the body is able to heal on its own. For example, if mobility to a certain part of the body is observed, they will manipulate that particular part to regain mobility. A visit to a Chiropractor usually cost a lot lesser than a visit to an Orthopaedic doctor. Some chiropractors even make the first consultation complimentary. Not only that, you are also able to fix an appointment at an earlier date as compared to an appointment with an Orthopaedic doctor. However, multiple visits to Chiropractors are required to be able to see results and in the long term, it may cost more than a visit to the latter. Orthopaedic doctors on the other hand are medical doctors. They specialise in the diagnosis and treatment of our musculoskeletal system. Many people have the idea that orthopaedic doctors are doctors who will recommend surgery for everything, from a torn meniscus to a dislocated bone. This is not true. Orthopaedic doctors will often only recommend surgery when all other available options are exhausted. If the injury can be treated with physical therapy, they will recommend that unless patients insist on surgery in the first place. Orthopaedic doctors will make use of medical technologies such as X-Rays and MRI scans to tell the patient what exactly is wrong with their body. They are also able to prescribe pain relief medications be it orally or via injections, something that Chiropractors are not able to. Deciding on a visit either to a Chiropractor or an Orthopaedic doctor is purely the decision of the patient. As a patient, you need to know what type of injury you have suffered and make your decision based on that. Different people prefer different things and be sure to know what results you really want. After seeing the wonders of Tiger Woods in the golfing world, many people are suddenly interested in the sport and it has seen a huge growth not only in America but also around the world. People from young to old are starting to learn how to play golf and well to do parents are also forcing their kids to learn golf as it is seen as a game that rich businessmen sign contracts over. However with the increasing in golfers, there is also an increase in injuries related to golf. What are they? Shoulder injuries especially to the muscles and tendons are extremely common due to overuse. Depending on the severity of the injury, it can cause a slight strain to a complete tear. Golf requires the use of the rotator cuff muscles during the swinging of the club and over prolonged usage of them, inflammation can occur, causing pain and tenderness. Amateur golfers are at a higher risk as they use their rotator cuff muscles much more than professional golfers due to incorrect swinging techniques. Golfer’s elbow is similar to tennis elbow just that they are caused by 2 different sports and the location of the pain differs. Golfer’s elbow are caused by overuse and cyclic loading of the tendons and it will result in inflammation, causing immense pain to the player. Pain will be felt at the elbow joint inside of the arm and it will cause a sharp pain even during simple task like squeezing something. De Quervain’s tenosynovitis affects the tendons that are at your thumb and will cause immense pain whenever you try to move your wrist or clench your fingers together. They are caused by repeated hand movement such as swinging the golf club for a prolonged period of time. Trigger finger occurs when an attempt to bend the finger towards the palm, the finger is locked in the position due to the tendon getting stuck. Trigger finger are common in people who frequently uses their hands repeatedly and can cause swelling of the tendons in the fingers, causing it to get locked in the opening of the sheath. Knee injuries can occur when the golfer swings the club and it results in a rotation of the knee, causing huge stress on the ligaments and the stress can cause the anterior cruciate ligament to tear. Depending on the power of the turn, it can even cause meniscus tear. Injuries associated with golf are common and are increasing mainly due to the increase in number of golfers nowadays. As mentioned above, most injuries are caused by repeatedly usage and incorrect usage of various muscle groups. Do take care when you are playing and give your body plenty of rest in-between golfing sessions. Regular exercise is good for our body and it lowers the risk of cardiovascular diseases. Many people thus have the impression that all kinds of exercise are good and safe. Due to time constraints, many of us choose to work out in a gym. However, not all of the exercise machines in a gym are safe. Some gym exercises are a complete waste of time while some may hurt your spine if they are not properly done or if you have existing problems. Many of us bend our knees when we are doing squats. Bending our knees too deep will cause our spine to get misaligned as it is unable to maintain the proper alignment. When misalignment occurs, our pelvis will start to tilt and our lower back will take over control and this will increase the stress to our back muscles, increasing the chances of injury to our spinal discs. We often see many people doing behind the head lat pull downs in the gym. However, this is not to be performed by everyone. Only those with very flexible shoulder joints should do it and extreme care must be taken not to injure their back with the pull down bar. Upright rows are done by holding a weight in the centre and placing both hands close together, bringing them up to just under your chin. However, this exercise will compress the nerves, causing issues to both the shoulders and the spine. While tight hamstring may contribute to back pain, improper usage of the hamstring stretching machine can contribute to spinal disc injuries. When we stretch out to touch our toes, it feels good for the hamstring but will add a huge amount of strain to our back. The entire weight of the body is weighing down onto the disc and it contributes injurious pressure to the discs and causing spine injuries. Many of us love to do free weights exercise in the gym and it can help us build wonderful muscles. However, headlining is bad for the back. Dead lifting is done when you bending over at your waist to lift a weight. Although it helps to build up strong back and leg muscles, it is straining the back and causing harm to your spinal discs. Not all gym exercises are for everyone and not every is good for the body. If you have existing conditions, always consult a specialist before doing certain exercises in the gym. Know your limits and do not attempt to do weights that are beyond yours as you will start using other parts of your body to lift them instead. We spend a third of our lives sleeping and quality sleeping is beneficial to our well-being. 95% of us sleep in the same position every single night and the sleeping position can impact our health both positively and negatively. It is thus very important to adopt the correct and best sleeping position for better health. Sleeping on the back is described as lying flat on the back, placing the head on a pillow for support and the body facing the ceiling in an upwards position. Sleeping on the back is a good position as it keeps the spine and head aligned together in a straight line. It is especially ideal for patients suffering from joint pain as it distributes the body’s weight evenly. Try keeping the toes pointing upwards but often, the toes will be pointing sideways. Try placing a pillow beneath the knees for extra support. Always use a neck support pillow to provide additional support for the cervical spine. Sleeping on the side is described as lying on the sides with both legs straightened and the head on a pillow and the hands in front of the body. Sleeping on the side is another good sleeping position as the spine and head are aligned. Sleeping on the sides also help to reduce snoring. Do make sure that you do not bend your back too much as it will place a lot of strain on the neck and back, causing pain. One negative side to sleeping on the side is that it may cause wrinkles due to the face constantly pressing against the pillow. Fetal position is described as drawing both legs towards the chest and tucking them in. It helps to repair wear and tear in the back and reduce snoring. However, it is straining for both the neck and back, causing pain when you wake up in the morning. The fetal position also hinders diaphragmatic breathing. Prolonged period of sleeping in this position may cause your breasts to sag. Couples love to sleep side by side with each other, lying in each other’s arm. However, sleeping side by side in a constraint space will cause the body to go into a position which will cause strain to the muscles and joints. Prolonged period of sleeping side by side will cause back and shoulder pain and even possible misalignment of the neck. Your favourite sleeping position could possibly cause you neck and back pain, wrinkles and even breathing problems. Decide on which are the best positions for you to sleep in and avoid those that are harmful to your health.